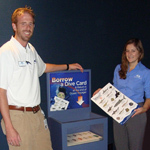 Georgia Aquarium Species Carts - Marketing Specifics, Inc. Species Carts It is always fun to design and build work for the Georgia Aquarium. The people there are great and the fish are fun to visit!